Every year, starting from November, the town of Tokyo gets a romantic allure with winter lights flickering on at night. The theme of winter lights is not limited to Christmas. 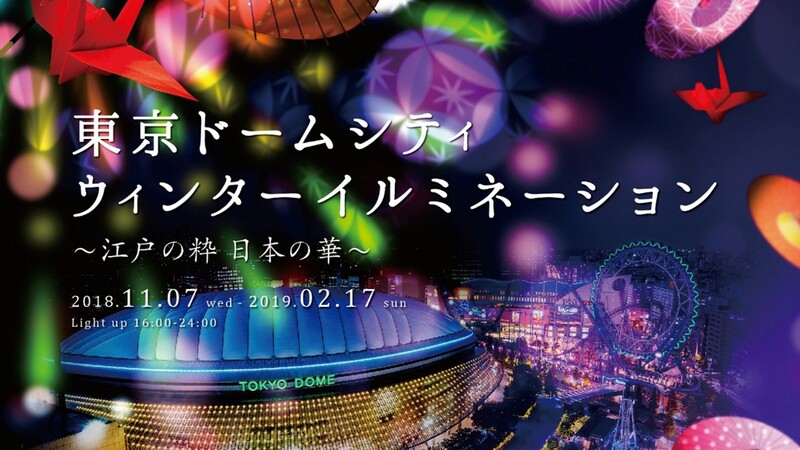 One of the popular venues for outdoor illumination, Tokyo Dome City will host its annual event, for the 14th time this season, with colourful, delightful, “traditional Japanese motifs”. The admission to the amusement park and the illumination is free. The illumination at LaQua zone features radiant motifs and designs of Edo-kiriko glassware. The projected motifs will change like a kaleidoscope in interaction with visitors. Edo-kiriko is a glassware developed since the Edo period, with beautiful geometric patterns applied on the surface by cut-glass technique. On the site, find also a selection of real Edo-kiriko glasses on display. Vote for your favourite one and get a real Edo-kiriko glass – if you are lucky to be selected by lottery. A dome with a height of 10 meters and a diameter of 12 meters will be lit with pretty motifs of temari, a Japanese handicraft. A temari is literally a “hand-ball”, which is embroidered with kimono-like decorative patterns. The temari illumination will alternate colours and motifs sensing the moves of people. A corridor of about 140 meters will shine brilliantly like a Japanese kaleidoscope. In the Viking Zone, an “Origami Tree” of some 6 meters high will be brightly decorated with cranes and balloons of origami. The corridor of 100 meters connecting Meets Port and Attractions zones will be lit with bamboo lanterns, which emit strings of lights from beautifully-cut designs. Elegant, handmade “wagasa” or Japanese umbrellas from Gifu prefecture, in central Japan, will be on display.